Installation of our pop-up liquid level gauge in the 3/4" bung allows visual monitoring of waste level in the drum and helps you plan ahead for drum removal. It also eliminates the mess caused by overfilling! Unique zig-zag channeled surface diffuses splashing. Level surfaces allow filters, paint cans, buckets and bottles to remain upright while draining passively. Optional hinged cover keeps dirt and unwanted materials out of your waste stream. It's also lockable for secure drum management. 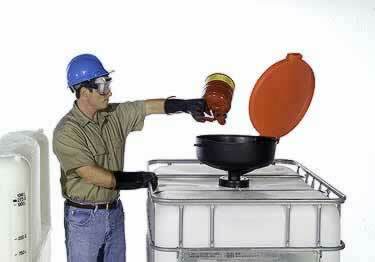 Securely fits nearly every 55-gallon tighthead steel or polyethylene drum manufactured throughout the world. This "one of a kind" funnel features eight (8) locator feet with four (4) different centers around its lower circumference. These design elements allow the Global Ultra-Funnel to fit tightly on drums with varying diameters. No more wobbles or tips! Rugged, polyethylene funnel offers a 22" wide "target", eliminating overspills which commonly occur with conical funnels. Patented, zig-zagged pouring surface quickly settles liquids as they are being poured. Horseshoe design feature allows installation of a Pop Up Fill Gauge - allows accurate monitoring of liquid level inside the drum to prevent messy overfilling. Lockable cover prevents contamination of contents. Built-in vent - No more splashing or "burping" when pouring liquids! Threaded brass insert screws into 2" drum bung. All polyethylene construction won't rust or corrode - provides excellent chemical resistance. Hinged, lockable lid prevents unauthorized access. New, larger style provides bigger pouring area and easy access. Where environmental safety is a concern. Choose from Drum funnels to Bung Access or even the Global Funnel. A perfect solution to keep spills under control. comes in Black/Red and Yellow. Great Product, perfect for what I needed! Very happy with my purchase of the drum funnel bung access,with hinge lid,with spout. Received it in a reasonable time after ordering, would recommend your company to others and looking forward to making other purchases.